I'm trying to find a way around the integration of Google and Facebook login for an Android application using the Clean Architecture. I would like to isolate the login specific SDKs in my data layer (which is a separate module in Android Studio). The issue I have for this particular use case (Google login for example) is that the SDK need to talk directly to my Activity (presentation layer). Once I have built a specific object, I need to call startActivityForResult from an Activity, and I receive a callback in the onActivityResult method of my launching activity, containing the login informations. None of this seems OK. Do you know a proper way to handle this use case ? That's fine. Names are a little different than I expected but it can work. That's a good instinct right there. Knowledge of which specific login SDK you are using should not be allowed to spread. Keep it in one place. Clean Architecture is not a principle but yes, this would be bad. Remember it's knowledge of which specific SDK that we're using that we wish to isolate. The idea of logging in is definitely something that cuts through the layers. As you descend the layers knowledge about the details about the login should be being stripped away. So google's login SDK can live in your Data layer but Presentation should just be thinking of this as a login to present in some language/API that the SDK speaks. That is your Output Port here. Domain should be thinking of login without caring what language/API the SDK speaks. So to me this seems ok. If you do it right. Not the answer you're looking for? Browse other questions tagged android clean-code google login or ask your own question. 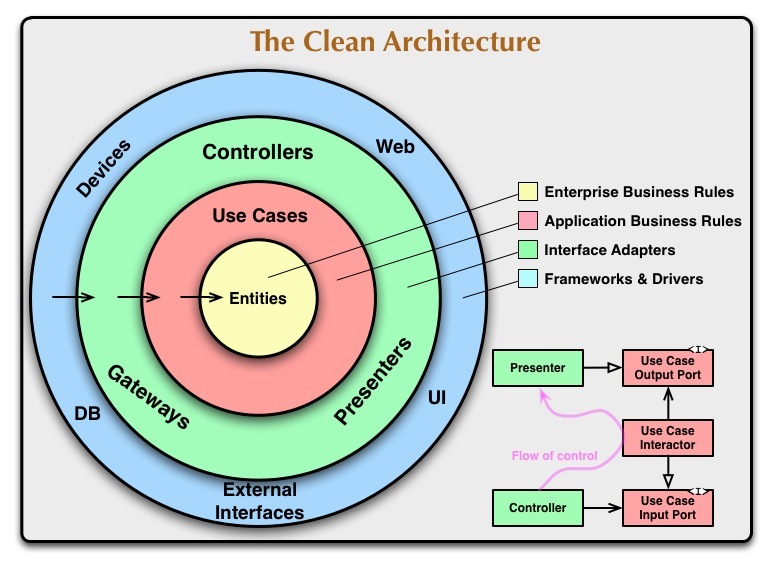 Clean architecture: should users go in the use case layer or the domain layer? How compatible are data science notebooks with clean architecture?